I love this kind of thing. The New York City where we can find an icon based on something so ordinary, it defies comprehension how it attained mythic status. Its very ordinariness drives it. I think it is a form of defiance - our sense of self importance is such that New Yorkers can take something completely mundane, champion it and say: "This is the definitive coffee cup. Why? Because we say so! We don't have to pander to outside fashion or fancy cups. We set the rules. And the Greek motif coffee cup is what we choose. We eschew all others." Of course the entire process is the confluence of many factors, historical, practical and otherwise. But once something here has been established as a de facto standard, New Yorkers hold on in a tenacious manner. The classic, Greek themed, blue and white design - the Anthora - was originally designed by Leslie Buck of the Sherri Cup Company of Kensington, Connecticut in 1967. The large number of Greek-owned coffee shops New York City seemed to be a ready target for a themed coffee cup. The name was inspired by an article about a sunken Greek ship laden with Amphora (Greek urns). Anthora is a corruption of the word, based on a misprint in an article. Greek Amphora were typically decorated with geometric designs around the neck - this concept was adapted to the upper and lower rim of the 10 ounce paper coffee cups. 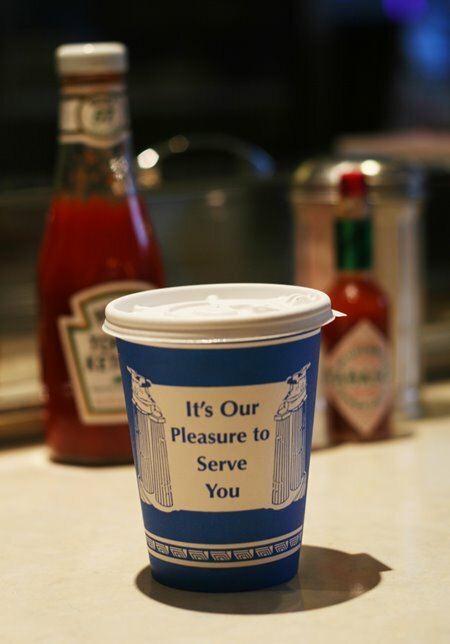 There are a number of competing brands of the Greek coffee cup, but all have some variation of the original message "We are happy to serve you." The one in the photo is no. 110 by Premier Paper Manufacturing Corp. circa 1997. A set of Corinthian columns graces the front with the words "It's our pleasure to serve you" and a discus thrower on the back. The original design is now owned and manufactured by Solo Cup Company. See the link here for a gallery of Greek-motif cups. The Greek-themed blue-and-white design is now on sale as a ceramic mug at the Museum of Modern Art. And a whole line of products like T-Shirts can be found with the Anthora image. It can also be seen in shows like NYPD Blue, where the cup lends a sense of New York City authenticity. The photograph was taken courtesy of Joe Jrs. Diner - the subject of a future story.